VUDU finally came to Boxee Box! Good news for Boxee Boxes owners and VUDU subscribers. With the latest firmware update you’ll have access to the VUDU content from your Boxee Boxes. Moreover, Boxee supports 1080p HD video at 24 fps and Dolby Digital Plus 5.1 surround thanks to VUDU TruFilm technology which optimizes the encoding, transmission and display of HDX movies. Unfortunately VUDU is available for the US only. But you still should upgrade your Boxee Box. Because except VUDU the latest firmware brings a lot of other changes and bugfxies, i. e. forcing of subtitle automatic selection during MKV file playback, support for language selection in subtitle/audio or settings to control de-interlacing and video filters configuration. To run upgrade procedure just go to Settings>System>Update and wait till the system download and install it. VUDU starts 3D stream next week! Lucky VUDU subscribers will be able to watch 3D movies starting next week. They should be worry about increasing of their Internet speed. Because the 3D content will require the same amount of the bandwidth as the 2D streams. Except 3D compatible TV consumers will need supported devices such Blu-ray players or STBs. Currently VUDU supports a few models but it’ll increase them in the future. Good to see PS3, Boxee Box by D-Link and Iomega TV with Boxee in the supported devices list. Today Boxee announced its partnerships with VUDU HD on-demand movie service. This is a clever step on the threshold of Boxee Box release on November 10th. Unfortunately, the VUDU is available in states only. But still. Next to Netflix another US online content provider VUDU comes to the AV devices. Its Apps will be added to the HDTV by Mitsubishi, Sanyo, Sharp and Toshiba. Toshiba will also integrate Vudu Apps in to their line of internet-capable Blu-Ray players. A list of applications is huge. Except VUDU Streaming Movie Service, it includes Flickr, Picasa, YouTube, Twitter, Facebook, Diggnation HD and much much more. This is a good tendency when online services are integrated directly to TV or player. The bad thing for non-US citizens is that the either VUDU or Netflix is not available outside US. Just wondering about availability of VUDU Apps in Europe. 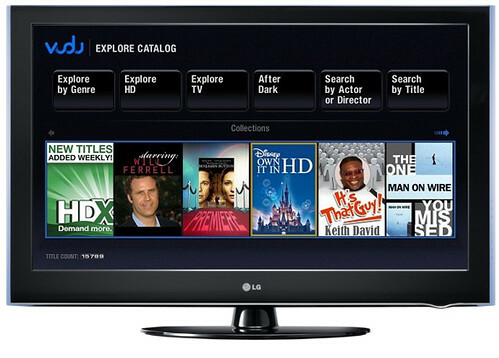 After Netflix LG decided to add VUDU service to its LH50 HDTV line. The owners of the 47LH50, 50PS80, 60PS80 and 42LH50 will be able to buy or rent HD and HDX (1080p) films on demand through a refreshed user interface that promises no stutters or buffering waits. Additionally new VUDU interface will allow instant fast forward, rewind and start for all movie qualities. That’s really good because consumers will get rid of one box and at least three wires in their A/V stands. Will wait for similar service for Europe.